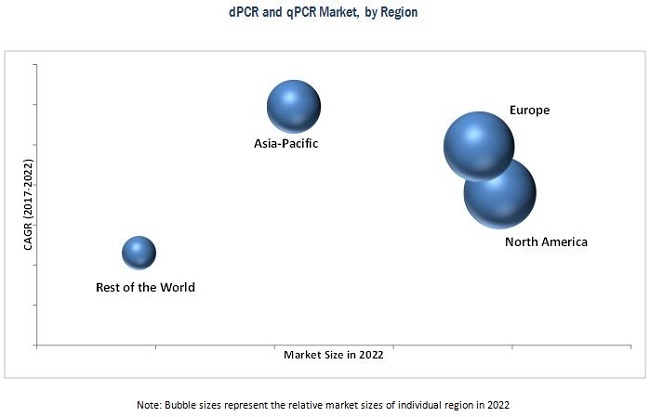 [215 Pages Report] The digital PCR market is expected to grow from USD 3.47 billion in 2017 to USD 5.31 billion by 2022, at a CAGR of 8.9% during the forecast period. Polymerase chain reaction (PCR) is a well-established technique used for the in vitro amplification of a given nucleotide (such as DNA). This technique is used in the preparation of multiple copies of a gene and for synthesizing a large amount of DNA molecules from a given DNA sample. This is done by separating the two strands of the DNA, marking its location with a primer, and using a DNA polymerase enzyme to synthesize and assemble a copy of the gene alongside a template. Factors such as the growth in the geriatric population; rising incidence of infectious diseases and genetic disorders; technological advancements in the field of PCR; and increasing investments and availability of funds for PCR-based research are driving the growth of the global dPCR and qPCR market. Additionally, the growing market penetration of dPCR and qPCR technologies in emerging countries and shift from plant-derived to genome-based drug discovery are expected to offer significant growth opportunities for companies present in this market. The base year considered for the study is 2016, and the forecast has been provided for the period between 2017 and 2022. On the basis of technology, the global dPCR and qPCR market is segmented into quantitative PCR (qPCR) and digital PCR (dPCR) technologies. Among the two categories, qPCR segment accounted for larger share of global dPCR and qPCR market in 2017. However, the dPCR segment is growing at faster rate during the forecast period. This is mainly attributed to ongoing technological developments in the field, significant adoption rate of dPCR products among key end users (as compared to qPCR and other PCR products) across mature markets, continued expansion in distribution networks of emerging dPCR product manufacturers, and growing private funding to develop and commercialize innovative dPCR instruments. 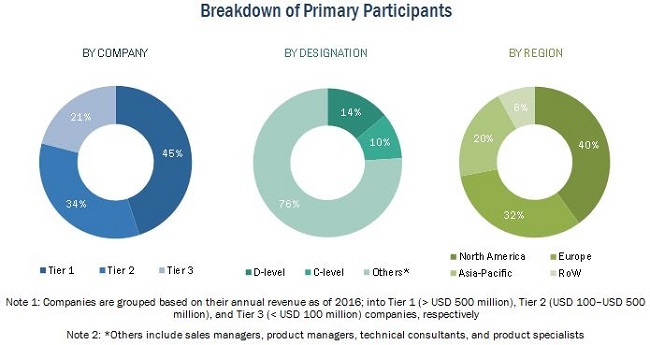 During this research study, major players operating in the dPCR and qPCR market in various regions have been identified, and their offerings, regional presence, and distribution channels have been analyzed through in-depth discussions. Top-down and bottom-up approaches have been used to determine the overall market size. Sizes of the other individual markets have been estimated using the percentage splits obtained through secondary sources such as company annual reports, investor presentations, Hoovers, Bloomberg BusinessWeek, and Factiva, along with primary respondents. The entire procedure includes the study of the annual and financial reports of the top market players and extensive interviews with industry experts such as CEOs, VPs, directors, and marketing executives for key insights (both qualitative and quantitative) pertaining to the market. The figure below shows the breakdown of the primaries on the basis of the company type, designation, and region considered during the research study. Some of the major players in the dPCR and qPCR market include Thermo Fisher Scientific, Inc. (US), F. Hoffmann-La Roche Ltd. (Switzerland), Bio-Rad Laboratories, Inc. (US), QIAGEN N.V. (Netherlands), Takara Bio, Inc. (Japan), Agilent Technologies, Inc. (US), bioMérieux S.A. (France), Fluidigm Corporation (US), Danaher Corporation (US), Abbott Laboratories (US), Merck KGaA (Germany), Promega Corporation (US), Becton, Dickinson and Company (US), Meridian Bioscience, Inc. (US), and Analytik Jena AG (Germany), among others. What are the major revenue impacting factors and key trends in the market? Where will these factors lead the dPCR and qPCR market in upcoming 4-5 years? What are the key growth strategies adopted by the leading as well as emerging market players to sustain their growth in the dPCR and qPCR market? What is the emerging competitor landscape for digital PCR instruments market; especially for established markets? How NGS and microarray platforms would impact growth potential of digital PCR market? Market dynamics and value estimations for PCR reagents market; key strategic initiatives adopted by major players to strengthen their revenue share. On the basis of technology, the global dPCR and qPCR market is divided into two categories, namely, quantitative/real-time PCR (qPCR) and digital PCR (dPCR). On the basis of product and service, the market is categorized into instruments; reagents and consumables; and software and services. On the basis of application, the dPCR and qPCR market is divided into—clinical applications, research applications, and forensic applications. The dPCR and qPCR clinical application is further sub-segmented into pathogen testing, oncology testing, blood screening, and other clinical applications. On the basis of end user, the dPCR and qPCR market is categorized into—research laboratories and academic institutes, pharma and biotech companies, hospitals and diagnostic centers, clinical research organizations, and forensic laboratories. The dPCR technology segment is expected to grow at the highest CAGR during the forecast period, owing to the ongoing technological developments in dPCR, significant adoption rate of dPCR products among target end-users, continued expansion in distribution networks of emerging dPCR product manufacturers, and growing private funding for the development and commercialization of innovative dPCR instruments. 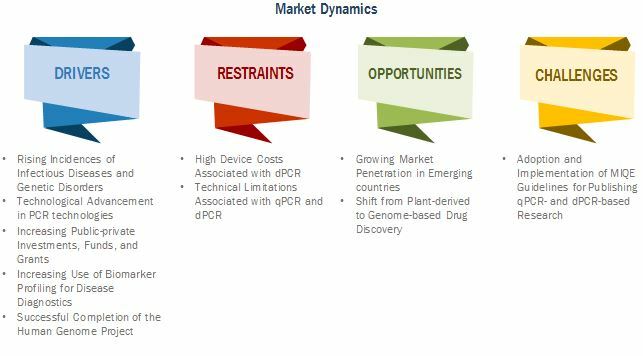 The key players in the dPCR and qPCR market include Thermo Fisher Scientific, Inc. (US), F. Hoffmann-La Roche Ltd. (Switzerland), Bio-Rad Laboratories, Inc. (US), QIAGEN N.V. (Netherlands), Takara Bio, Inc. (Japan), Agilent Technologies, Inc. (US), bioMérieux S.A. (France), Fluidigm Corporation (US), Danaher Corporation (US), Abbott Laboratories (US), Merck KGaA (Germany), Promega Corporation (US), Becton, Dickinson and Company (US), Meridian Bioscience, Inc. (US), and Analytik Jena AG (Germany), among others.